$7 General (at door); Free for Friends of the MAK Center and Members of Les Figues Press. Hosted at the MAK Center Schindler House in West Hollywood, Q.E.D. II is a series of performances curated around issues of affinity, influence, and provocation. This program will include three events over the course of three months (March 13, April 8, and May 15); each evening will feature a Les Figues author alongside two additional writers and/or artists, whose work has impacted that of the author's. Q.E.D. 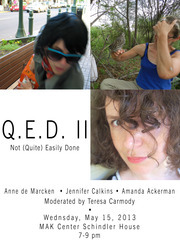 II builds on our 2012 Q.E.D. series on queer art and literature that asked questions regarding bodies, sexuality, and identity. This year, in inviting Les Figues authors to act as both participant and curator, Q.E.D. II emphasizes communities of influence over issues of queerness—underscoring that both are bonds of affinity. The May 15 event features Les Figues author Jennifer Calkins, alongside writer/filmmaker Anne de Marcken and writer Amanda Ackerman. The performances will be followed by a town-hall style discussion, as moderated by Teresa Carmody.